Genovese, Gambino, Bonnano, Colombo, and Lucchese. For decades these Five Families ruled New York and built the American Mafia (or Cosa Nostra) into an underworld empire. Today, the Mafia is an endangered species, battered and beleaguered by aggressive investigators, incompetent leadership, betrayals, and generational changes that produced violent, unreliable leaders and recruits. A 20-year assault against the five families in particular blossomed into the most successful law enforcement campaign of the last century. 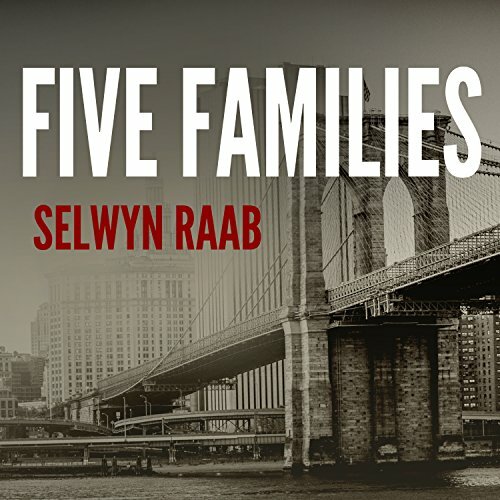 Selwyn Raab's Five Families is the vivid story of the rise and fall of New York's premier dons, from Lucky Luciano to Paul Castellano to John Gotti and more. The book also brings the listener right up to the possible resurgence of the Mafia as the FBI and local law enforcement agencies turn their attention to homeland security and away from organized crime. I love the mob history, the book informed me of alot of things I did not know. however although the information was great the narrator was very monotone and at times find myself drifting away. if you like mob history it is a great book. but I compare it to the boring history teacher. Love me some mob stuff! I've been fascinated with La Cosa Nostra since I was a teen in the 80's. I've read many books and have watched everything I know of concerning it. I'm not as expert level as Selwyn Raab, though I'm well informed. This is a great and fairly deep history of the American mob. Starting with it's roots in Sicily on through to the 00's. I learned of many "characters" and tidbits about the dysfunctional mob family that I didn't know of before, which thrilled me. I put it on at a random spot at night and listen to stories until I fall asleep. For me it's well worth the price of admission. To be perfectly honest, one of the reasons I chose this book was that I’m getting towards the end of my credits for this year, and so I was looking for a long book. I’m quite interested and curious about the mafia, and so, at 33 hours, I thought this would be a good listen. It has many merits: It’s a pretty comprehensive account of organised crime in America in centuries 20-21, and it can't have been an easy story to unearth. The Cosa Nostra has been a phenomenally secretive and devious organisation throughout its lifespan. All members of the fraternity are bound by their most sacred rule ‘Omerta’- meaning, literally, ‘being a man’, but in practical terms ‘Omerta’ refers to secrecy rather than manliness; a strict code of silence, under pain of death, to which all Mafiosi are sworn. There’s a certain amount of romanticism surrounding the Mafia. I’m as much a sucker for this as the next person. I realise it’s probably the result of gangster movies from the thirties with stars like Edward G Robinson and Jimmy Cagney, and, more recently, the brilliant 'Godfather trilogy'. In the early years the mafia gained a foothold by providing some popular services deemed illegal by a prudish establishment. They provided alcohol during prohibition and facilitated gambling – banned by the government but craved by the populace. The public was happy to turn a blind eye to this criminal activity and often saw the mafia as the good guys and the authorities as the bad guys - But in reality the mafia have always been a very nasty bunch of people, heaping misery on the everyday American, a parasite on the backs of honest, hardworking citizens. This book tells that story. The authors overcame the secrecy barrier by researching the evidence from rare cases where 'Omerta' was compromised – most of it coming from the few Mafiosi persuaded to testify against their fellow mobsters - and from wire taps. All credit to the authors for finding and collating this information. But it takes more than this to make a really good listening experience. It isn’t enough for all the information to be there in the book, it also needs to be in a coherent order. It felt like ‘7326451’ instead of ‘1234567’. Verdict: Definitely worth a listen – I did learn a lot about the mafia – but the story was out of order. I'm only 8 hours into this mammoth book, so can't comment on its entirety, but I have to take a break for a few days. The narrator has a clear and pleasant voice, but he puts very tiny pauses in the wrong places, especially with dependent clauses. That makes the phrase seem like it belongs to either the previous or following sentence. It becomes very irritating. Also, this is just too long. There is a lot of interesting material, but I think it would be one book I'd prefer to have in an abridged version. The most indept book on the subject I've listened to, the narrator in the beginning is a little boring, but once you get use to his voice the book gets better and better. I would absolutely recommend this. Would make a great gift. This is well-told, entertaining, very informative set of interconnected and factual short stories about the Mafia, centered on NYC, but tales take the listener to Tampa, Nevada, LA, Chhicago, Upstate NY, New Orleans...so many connections, so many GREAT stories.You'll get to know about the early mobsters, at the turn of the century - the actual beginnings of the 5 big families of NYC...through the depression, into WWII (did you know Lucky Luciano had been deported to Italy in the '30s, and lived there through the war...and made a ton of $ because of it? ), the political machine in NYC...multiple Congressional Queries, the Kennedy Assassination, so much more....Can't recommend the book highly enough. Truly a 5-Star experience. What does Paul Costanzo bring to the story that you wouldn’t experience if you just read the book? Paul did a great job. So many different characters he played - excellent. Would definitely be interested in checking out other audio performances by Mr. Costanzo.That said, on the recording itself, there were some hiss and volume issues (in Volume 1, I think), hence only 4 stars on the Performance. All the stories about Hoover willfully ignoring (and/or not believing in the existence of) the 'Commission' was interesting and very entertaining. I literally laughed out loud at times...Hoover was a real 'piece of work'...ha! After listening to this I feel like I've just taken Mafia 101. Included is a history of Cosa Nostra in New York, including a biography of main players, reactions and tactics of law enforcement, a basic introduction to he rackets or the ways the mob makes money, it's structures, and hours of entertainment. I personally found it riveting and finished it very quickly. If you've been at all interested in the Mafia at some point in your life and want to delve into the whole, fascinating story, than I highly recommend this. The book tries to cover the entire history of the mafia in New York since 1900. Even though the book is very long, it only has time to skim the surface. It also makes the book seem repititious, as mobster after mobster engages in the same loan sharking or union tampering, and vies for promotion. There is very little new in this book that has not already appeared in the press. The writing is clear and the narrator is good, but this was a disappointment. Would you listen to Five Families again? Why? Yes, Raab is an excellent author and is an expert in this field. Also, I like the narrator. He adds drama and pace to an already interesting story. If you could give Five Families a new subtitle, what would it be? A real history of the Mafia. I was very happy that I bought this book. I highly recommend to anyone who is interested in the Mafia. This was my first audiobook and I loved it. I'm a big fan of Selwyn Raab and he did an amazing job. My biggest issue and the reason for 4 stars is because I had problems keeping up sometimes, it was hard to follow. I wish the narrator lived more into it. I highly recommend watching the mini series "The Making of the Mob: New York". Selwyn Raab is featured a lot in the series and he also helped writing it. So it's kinda like having parts of the book in a TV Show. Good book, although a bit unprofessional. This book is an excellent historical review, but the frequent insults describing mobsters lacks professionalism.